In fact, I buy etiquette books and read them for pleasure. CALL. ME. CRAZY. I'm drawn to etiquette because I tend to lean traditional, and love knowing the proper way things should occur. It's fun, and knowing the proper way gives me confidence in uncertain situations. 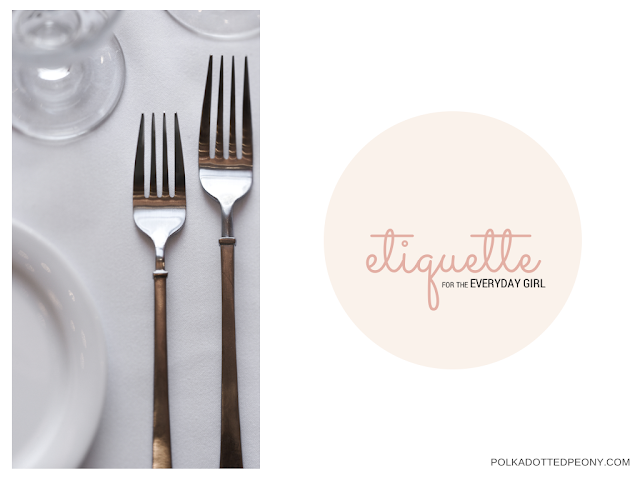 I'm introducing a new series here on the blog called Etiquette for the Everyday Girl. You can count on etiquette essentials for this modern world - in business and in life. YAY! In business, introduce the CEO to the Director of Operations: "Hailey, (CEO), I'd like to introduce you to Taylor (Director of Operations)." Think of it this way: The Director of operations should already know who the CEO is. The CEO, on the other hand, wouldn't necessarily already be acquainted with the Director of Operations). In life, introduce the elder person to the younger person: "Grandpa, please meet my friend Carter." What are your favorite etiquette tips? What etiquette questions would you like me to cover in this series? Q for you - what if they are peers?